My daughter, Brooke, recently joined our team after 4 years at a local printing company. She has a bachelors degree in Graphic Design. 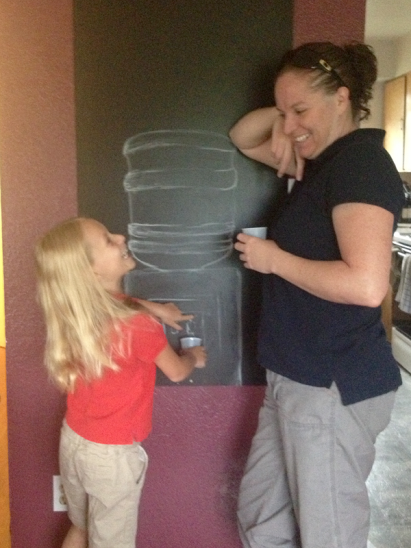 Brooke and her daughter Chayse are taking a break at the "water cooler" (drawn on the chalk board in her house). Chayse is following in her mom's footsteps with her artistic talent and imagination. Why do we need a Graphic Designer? Simple...to make things shine! And that is what Brooke does best! So what exactly does she do? She is my personal assistant. (Doesn't that sound fancy?) It's great having someone help you who can read your mind. She also knows the answers to all my technical computer questions! She designed our new catalog with our editor Nikki and myself. She also is helping with the website. I'm very blessed to have her as part of our team!! The first month of working with her full time has been so much fun. Get to know her and our other employees (we just call them family) here on my blog. I will try to introduce you to each of them over the next months.